19 Tips and Tricks on How to Live Large in a Small Apartment | Homesthetics - Inspiring ideas for your home. Living in a small apartment does not have to mean sacrificing comfort and convenience. In fact, if you have an ingenious approach, a small apartment can offer an extraordinary amount of comfort and coziness ! We have prepared 19 tips and tricks to take your experience to the next level. 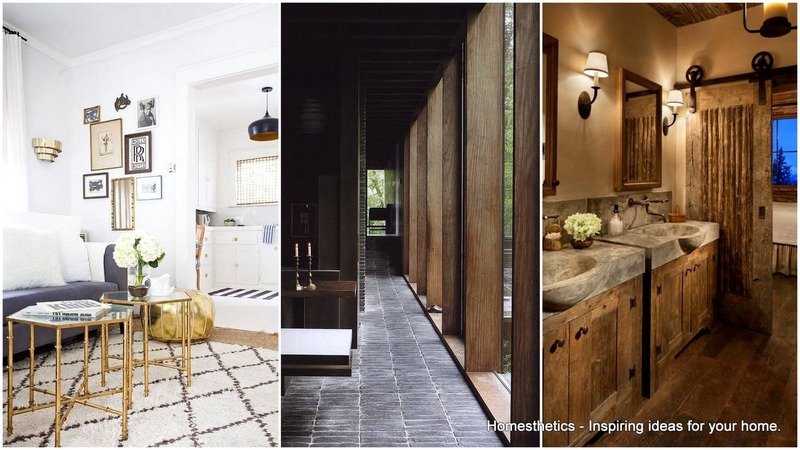 So, read along to find out which solutions work best for your small apartment. 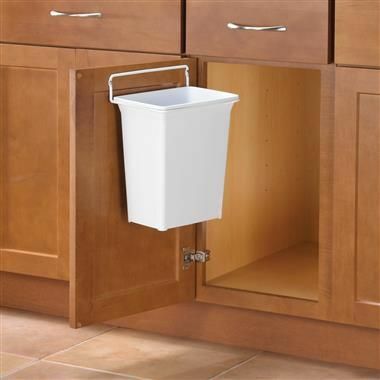 One of the most crucial things for living large in a small apartment is keeping your garbage bins out of sight. And one great way to do so is featured in the illustration below. If your household generates a lot of waste, then this solution is a no-brainer. 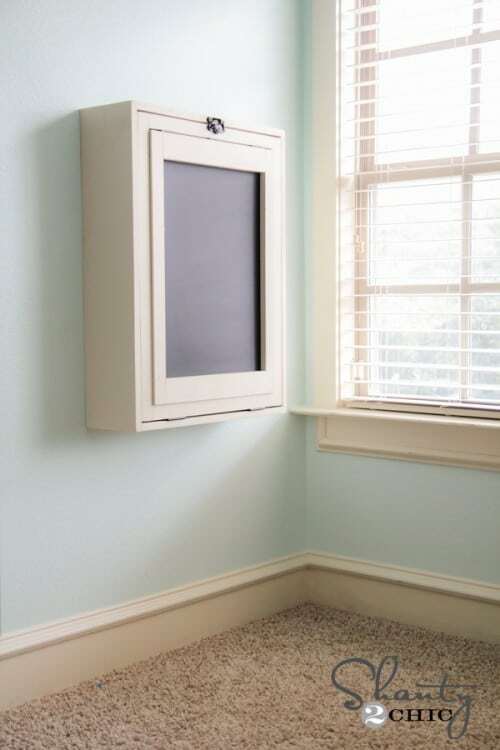 However, if that is not the case, then you can also considera smaller door mounted waste bin like the one showcased below. Needless to say, this option will let you store other items inside the cabinet. The space which is least utilized in a small apartment is surely vertical space. 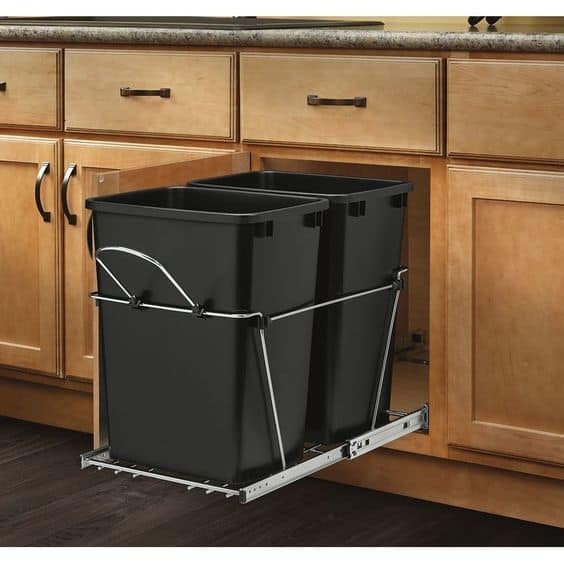 Instead of cluttering your kitchen counter with food containers, get vertically stackable containers like the ones featured in the illustration below. 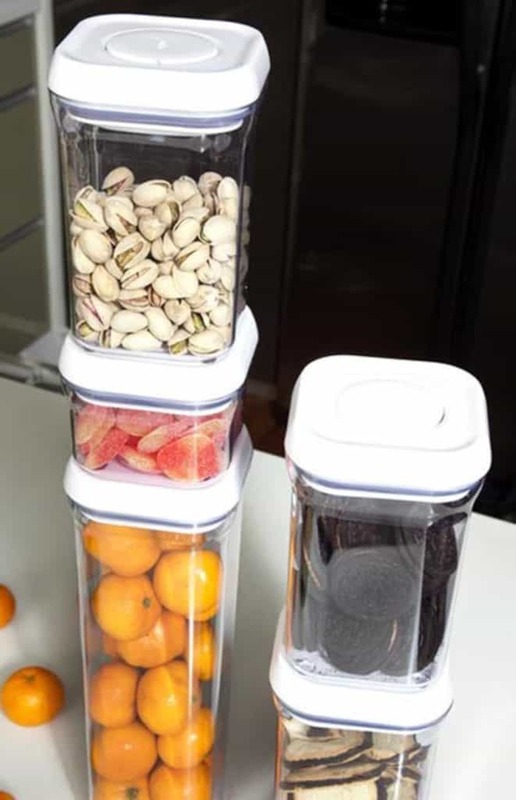 Just imagine how much space you will end up saving with a dozen of these containers. If you do not have enough space in your wardrobe, then there is no need to worry. Just install some coat hooks and store your large coats, jackets and other miscellaneous items. 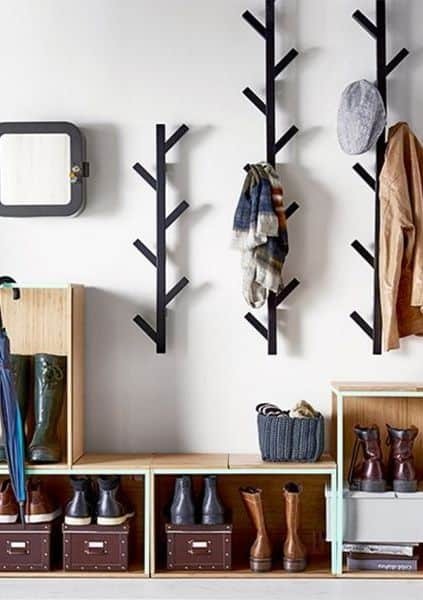 While standard coat hooks will do the trick, you can always go a step further by installing tree-like coat hooks like the ones featured in the illustration below. Not only do they look amazing, but they make great use of the space. Under the bed storage is one of the most common things which increase space considerably in a small apartment. 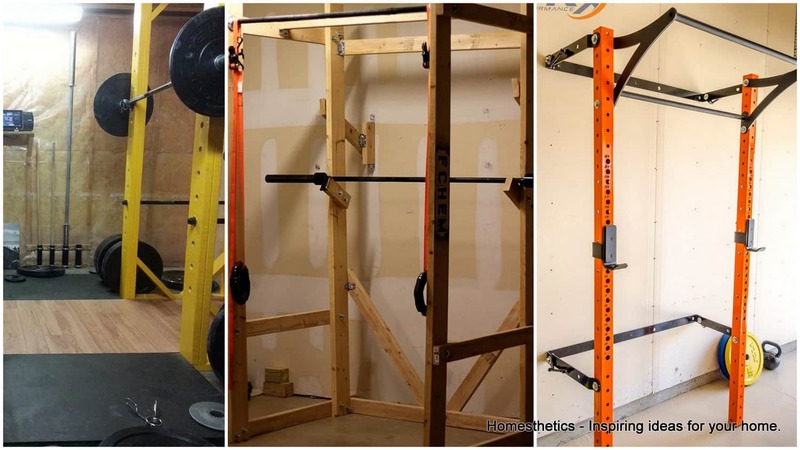 Although there are many different variations of under bed storage, our favorite would have to be the implementation featured in the illustration below. Having multiple pull-out drawer units not only makes it extremely convenient to take out the items you need, but it also helps in keeping your stuff organized. If you invite your friends over every now and then, having good seating options is a must. However, your interior space can easily get cluttered if you fill it up with chairs, armchairs, ottomans and so on. Instead, invest in some stackable chairs like the ones featured in the illustration below. 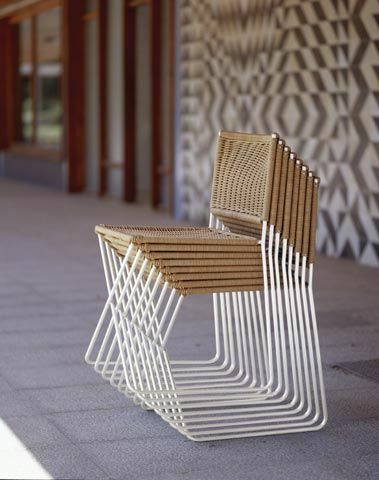 Not only are they a comfortable seating option, but they also look quite cool, don’t they? 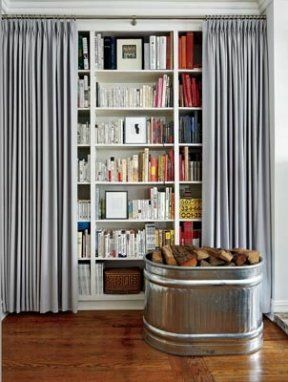 Moreover, once your guests have left, you can stack them up and save a ton of space. 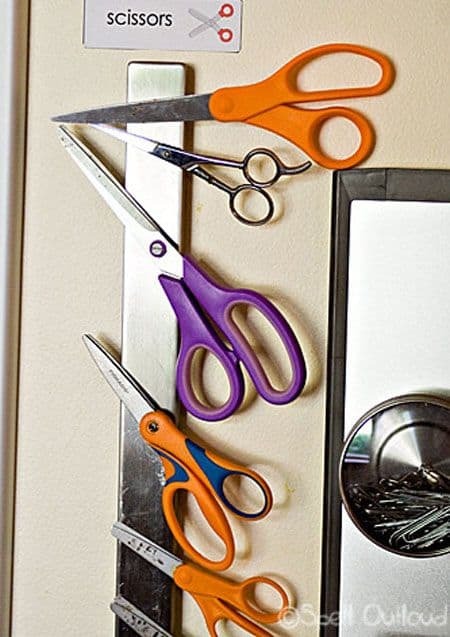 Strong magnet strips like the one featured in the illustration below can be really helpful in organizing your metallic kitchen elements like knives, scissors, and so on. 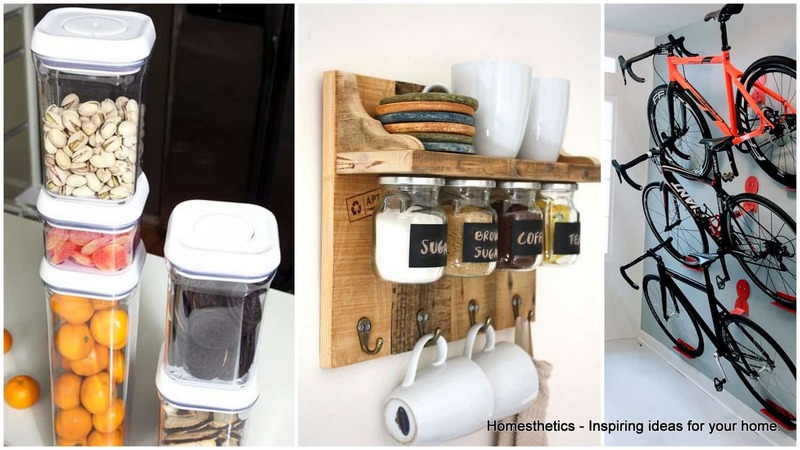 Moreover, it is not only a highly inexpensive option but one that keeps your kitchen counter free off clutter. 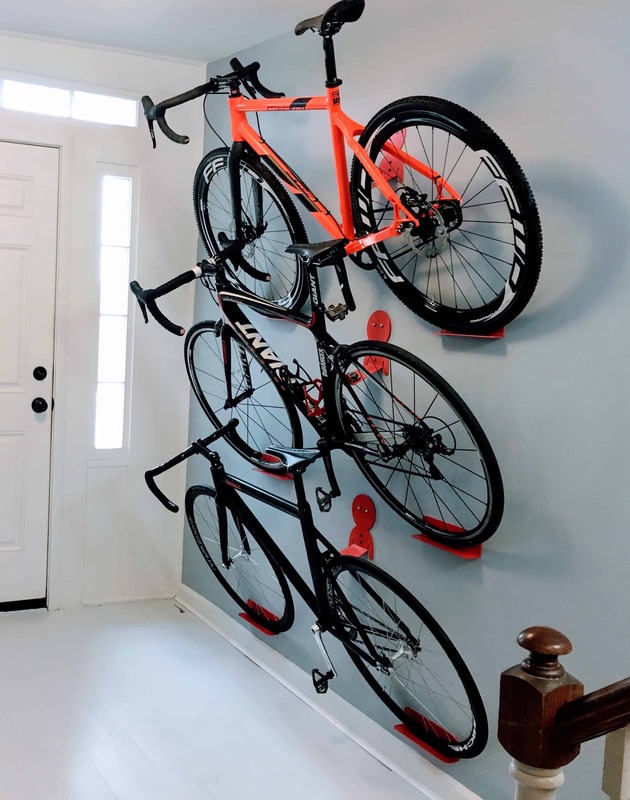 If you are a fitness freak and have a few bikes in your apartment, then you should seriously consider installing a bike rack like the one featured in the illustration below. Just look at how clean it looks. Needless to say, itclears up a lot of space. Although it is very underrated, curtained bookcases can make a significant difference to the interior of your home, especially if your bookshelves are not very organized. Just make sure not to cover it up with a garish curtain. Instead, keep things understated with a simple curtain like the one featured in the illustration below. Be it an armchair with bookshelves, or a sofa that converts into a queen size bed, having versatile furniture is a must for small apartments. Not only are they space saving, but they are also quite cool, don’t you think? Moreover, they are a lot lighter on the wallet. Just imagine buying a queen bed and a sofa separately. That will surely leave your wallet empty. Not to mention the valuable space they will eat up. Ottomans with built-in storage are extremely useful for small apartments. Moreover, you can replace your dining chairs with a couple of stretched out ottomans, like the one featured in the illustration below. 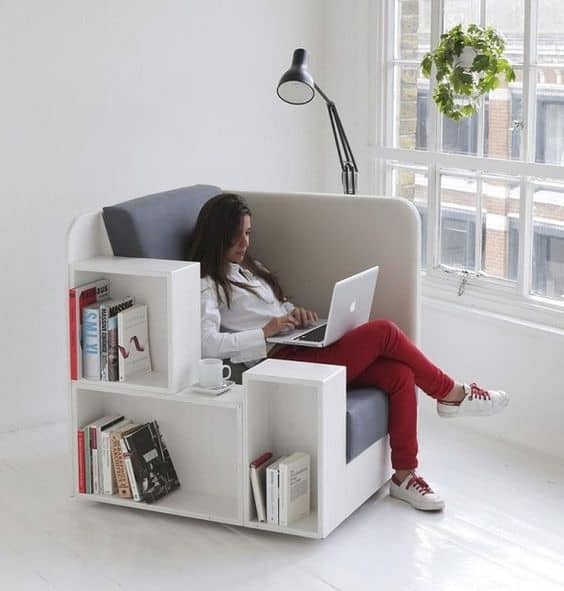 Not only will they be really useful for storing a lot of items, especially ones you do not want to be seen, but they are also quite comfortable for sitting. Sure, they do not have a backrest, but we believe small apartment owners will be more than happy to make that sacrifice for the versatility of ottomans. Storing similar items inside baskets can not only help you stay organized, but they also uplift the look of your storage shelves. Now, you can save some cash and buy multiple plastic storage baskets, like the one featured in the illustration below, or you can also go for high-quality wicker baskets. In case you do go for wicket baskets, do remember only to store dry items. Cleaning them can be quite an arduous task. 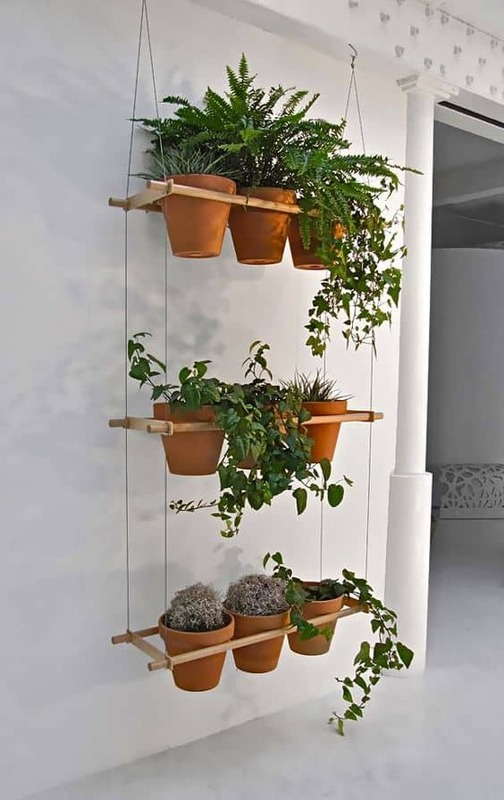 If you love houseplants, then you surely need to check out this ingenious solution. Not only does it look cool, but it also saves a lot of space. However, this particular ideais only meant for small plants. You cannot house large plants in this vertical fixture. In case you have the requirement for efficiently housing larger plants, then we believe that the solution featured in the illustration below should appeal to your needs. It looks really lovely, doesn’t it? Just take a look at the hanging jars featured in the illustration below. Not only do they look unique, but they are also incredibly practical too. Now, you might be wondering how these jars are stuck to the shelf? Well, the metallic lids are either stuck using super glue or screwed. For a more permanent solution, we suggest using screws. Glue can get weak over time, and that might result in a disaster. There is a small downside to hanging jars in this fashion,and that is the inconvenience you will face during opening and closing the jars. Then again, if you are trying to make the most out of your shelf space, we believe that this is the most elegant solution out there. For this idea, you will need mason jars. A lot of mason jars. You will also require an open cabinet with many compartments, like the one featured in the illustration below. 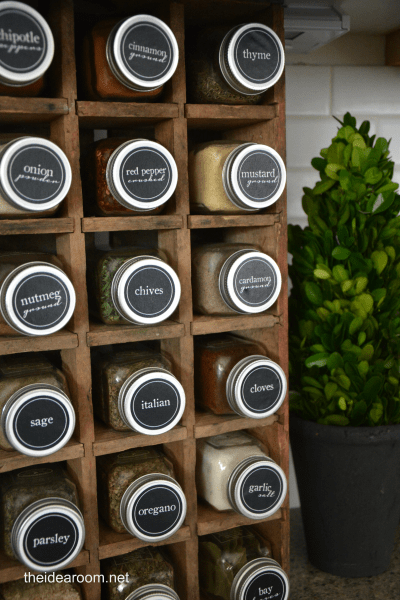 After you have gathered all the items required for this idea, you need toprint out labels of all your spices and cut them out to the shape of mason jar lids. Finally, screw the lids along with the labels and you are done! Now you not only have a unique way to store your spices in large mason jars, but it is also a highly convenient solution. You no longer have to fuss around the cabinet to search for the spices you need. Just look how clean the linen closet looks in the illustration below. And you can achieve this in just a few minutes! 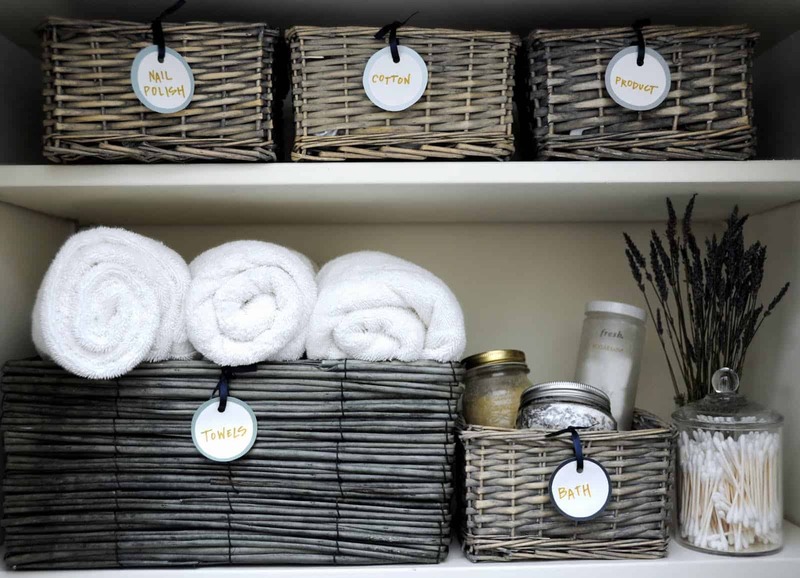 Start out by organizing all your bath and beauty products into multiple categories. Next, purchase baskets of various sizes, as required. And finally, put the respective items into the labeled baskets. That’s it! 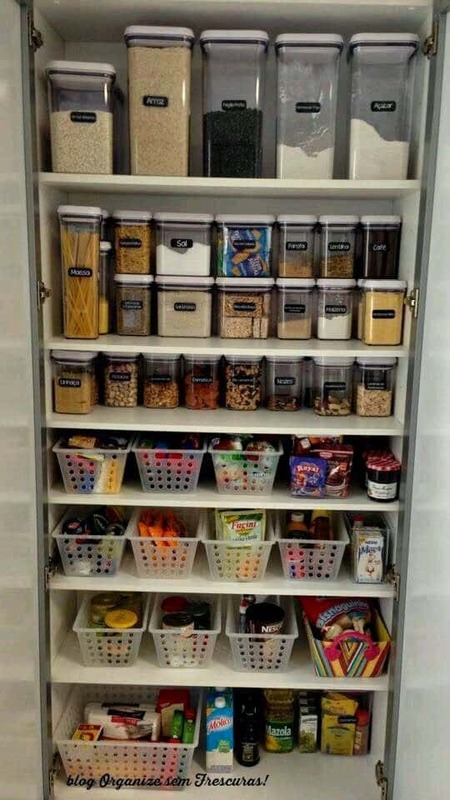 Keeping all your items organized like this really helps in a small environment. Moreover, there is a lower chance of misplacing items, and everything looks so much cleaner! Swinging doors can really eat into your living space. And it is something that is completely overlooked in most tiny apartments. 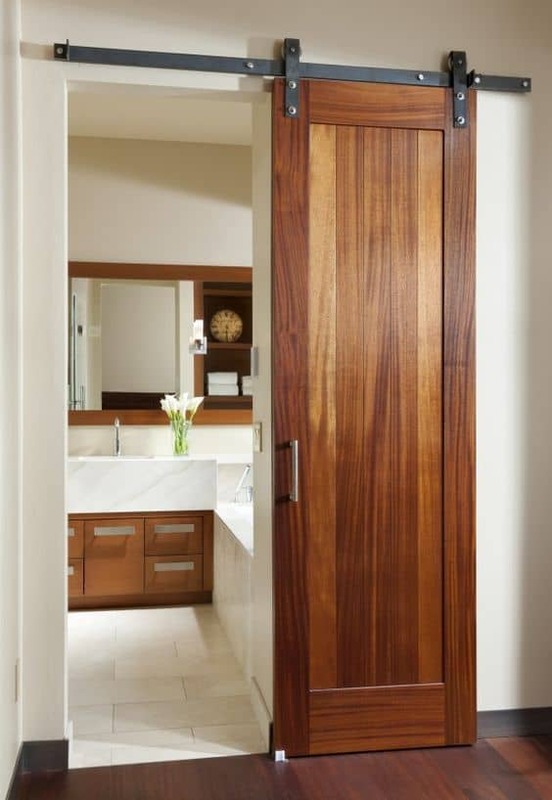 The placement of your furniture can be altered just due to these doors. Hence, you should switch them with sliding doors, like the one you see the illustration below. Sure, it might be asubstantial investment, especially if you are looking to switch every door in your apartment with sliding doors. However, we believe that it is totally worth it. Moreover, if you have some DIY experience, you can easily do it yourself and save a ton of money. 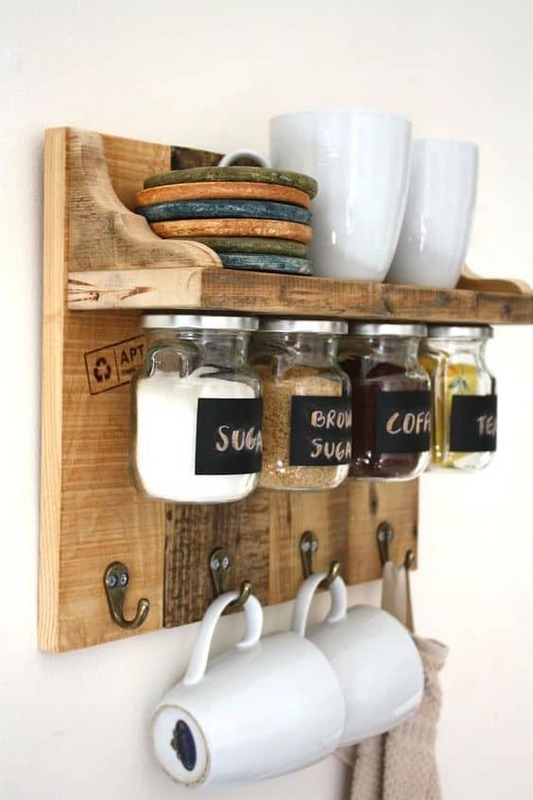 You can also use upcycled materials for this DIY project. Just take a look at this minimalistic foldout Murphy Desk. 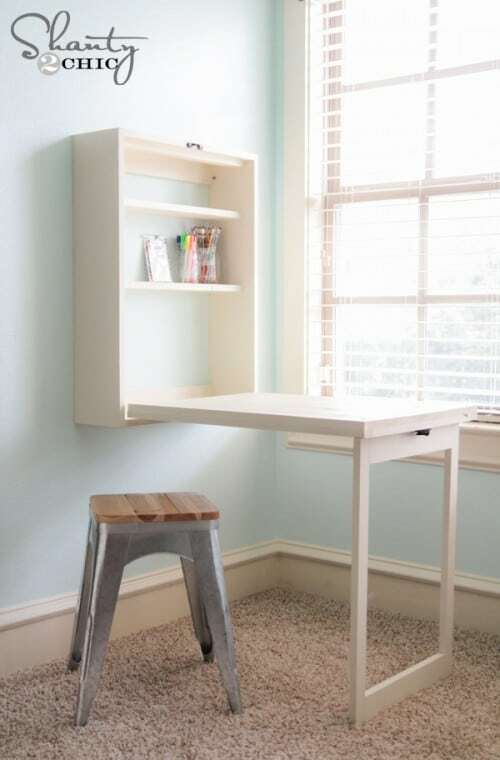 Not only is it brilliant for working, but it alsohas a substantial amount of storage to hide your work materials. But that is not all! This Murphy Desk has yet another trick up its sleeve. When it is folded up, it reveals a blackboard! Yes, that’s right! This is surely one of the most versatile desks we have ever come across. In case the blackboard does not appeal to you, then you can switch it with a whiteboard, or even a mirror. If you are interested in building one for your own home, then click on the link mentioned below the illustration to learn more. One easy way to expand space in a tiny apartment is with a versatile dining table like the one featured in the illustration below. When it is not in use, you can fold it down and convert it into a compact coffee table. However, we must say that convertible tables such as this one, do not come cheap. If you gave the last converting table a pass, then this might be more suited to your needs. 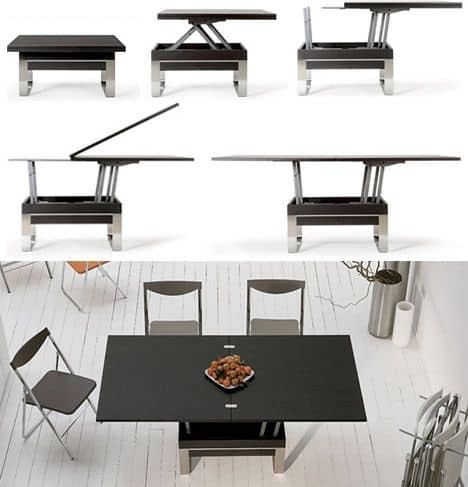 If you are dining alone, then you can keep the table in its elongated form as seen in the illustration below. Moreover, it works quite well as a work desk. And, when you have guests, you can join the two halves horizontally and form a table for four. These are just a few of the versatile dining table options available in the market. We encourage you to search the market yourself and find one that best fits your requirements. Finally, we have a simple but ingenious solution to make your living room look twice its size. Sure, having a large mirror does not magically increase the space. But the illusion of space is not something trivial. In fact, a similar concept is appliedto luxury car interiors where space is of utmost importance. Luxury car interiors are usually adorned with beige leather or with similar light-colored materials, to give a greater sense of space. 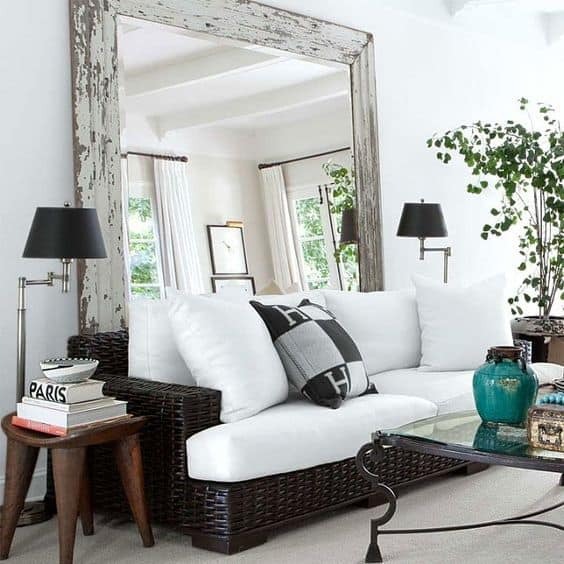 Hence, if you have done all that you can to increase your interior space, you can finish it off with a large mirror. Just remember to place it intuitively. That brings our article to an end. We hope that some of these tips and tricks will help you in making your small apartment more organized and clutter-free. If you end up implementing some of these ideas, do share your results with us. We would love to hear from you.